Judy Baar Topinka dedicated herself to a lifetime of service to the people of the State of Illinois. After graduating from Northwestern University, she began a career in journalism as a part-time reporter for the Berwyn, Cicero, and Stickney-Forest View Life Newspapers, before being hired full-time in 1971. During her award-winning journalism career, she was a reporter, education editor, feature writer, feature editor, and photographer. She received honors from the Illinois Women’s Press Association, the Illinois Press Association, and the Illinois State Medical Society for her work covering advances in the medical field. 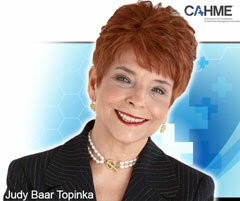 Judy Baar Topinka’s legacy is one of good government, ethics, compromise, and love of heritage. Her life demonstrates how anyone with passion, drive, and hard work can succeed in face of great odds. Judy took on the establishment and the status quo and succeeded. She never gave up in life, whether as a child, mother, student, newspaper reporter, legislator, or state level leader. Her life has solid lessons for future generations; she is a true role model in any environment. We need more people like Judy making things better for us all. The scholarship/honorarium is designed to fund living expenses or other costs while a student is an intern/fellow following a professional path in the spirit of the scholarship/honorarium’s namesake.